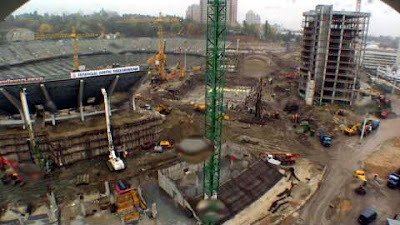 KIEV, Ukraine -- The main contractor working on construction of the Lviv stadium for the 2012 European Championship is to be removed after criticism of delays at the site by UEFA president Michel Platini, a top cabinet official said Tuesday. Ukraine Deputy Prime Minister Borys Kolesnikov said the contractor, Ukraine-based Azovintex construction company, will be discharged due to slow work. Platini said on Monday that construction in Lviv "has made no progress whatsoever." Another Ukrainian financial and industrial group, Altcom, will be new main contractor instead with Azovintex still doing minor work on the stadium, Kolesnikov said. Altcom deals with mining and construction. It's currently building a new runway at Donetsk airport, and has also been chosen as the main contractor to build a runway at Lviv airport. Kolesnikov said earlier Tuesday that an international consortium of Ukrainian, Turkish, Croatian and Macedonian companies will build the stadium instead, while Azovintex will continue doing minor work on the stadium. "The stadium will be built by late 2011 by all means," he said. There is also concern at the lack of hotels to host fans and teams in Lviv, along with the slow construction of new ones. Poor transport connections between the airport and the city centre add to the problems, according to Markiyan Lubkivskiy, the Ukraine Tournament Director for Euro 2012. "Lviv is on the verge of an abyss. Very little time remains. Lviv (can do) nothing but meet all UEFA requirements. There is no choice," said Lubkivskiy. Meanwhile, a construction company in Kiev said renovation work on the Olympic stadium, which is three months behind schedule, will catch up on its timetable by June. Platini is expected to visit Ukraine next week.